(Released May 14, last updated March 17, revised TGF core supplement protocol). Note: I recommend this book all the time for non-gluten people too. Why? I haven't yet had a chance to pull out all of the different sections and protocols for eg leaky gut, lowering inflammation, reversing autoimmunity etc, but they are all there and are useful to many different conditons and circumstances. This 300+ page book (I keep adding bits!) offers you a detailed, fully-researched, product-specific 3 step programme for any gluten related disorder. In essence the Gluten Plan is aimed helping you with any form of gluten related disorder from simple gluten intolerance (ha!) to full-blown NCGS with autoimmune involvement and everything in-between. Read more for what's in it below, and you can get a free Preview here. "What you have done is major. Be in no doubt." We start with a full introduction to the gluten problem and I have peppered it liberally with quotes and wise words from world gluten experts. Not least to increase the credibility of what I am saying, but also to give you confidence in your own thoughts about your body, and something to show your doctor! We go through why gluten was a wonder crop for us initially, and still is for some, but then why it now seems to be causing so many problems. We consider why we are following a gliadin-free, rather than gluten free diet, which is presumably a lot of the reason why, as the stats show, many coeliacs never successfully repair their villi damage and continue to suffer the consequences of that. We go through and debunk some really important beliefs about gluten illness (it’s mostly neurological, not gut; reintroducing gluten for testing can trigger more, potentially irreversible damage etc) and then go through the pathological process step by step so you can follow what’s actually going on in your body. The more you understand it, the more you realise you can do about it. This is a much extended version of the gluten testing Overview here. We go through step by step what happens in current diagnostics and, importantly, pick holes in each step! I then set out what I think the ideal gluten testing route really is, given everything we now know. It takes about 20 years usually for changes like this to happen in mainstream medicine, but the research is all there for us to action now and that’s really what this section is for. The flexibility kicks in again here and you have a kind of pick & mix of testing, depending on where you are and what you need to know. I have focused very much on practical testing; in other words, things that can make a real difference to the pathological process and to how you feel. You can test for England, but the question is: what will you do with the info you get? Will it make a treatment change? If so, it’s worth it. Have finished reading it today and totally amazed at the wonder of you, I do so hope you get the recognition you deserve because you truly deserve it infinity percent! This starts with the barrier stuff – all about hyper-permeability and why this inevitably leads to multiple food and environmental sensitivity. We go through the different types of leaky gut (permeability) tests and discuss the differences between them, when to use which etc. We talk about the sad fact that there is, no matter what anyone tells you, no one-diet-fits-all for gluten related disorders. The traditional gliadin-free diet is just not enough for most people with gluten illness. As we said, above, why do you think most coeliacs are not healing? The rest of the section is designed to help you identify what your specific healing diet might be. If you continue to eat foods your body mistakes for gluten, or that are simply inflammatory for you, it will scupper your healing. This is the most important – but also the most difficult – part of your healing plan. Some people may be fine on gliadin-free (the traditional GF diet), whereas others may need to come off grains, dairy and FODMAPs; still others may not be able to do salicylates or citrus foods etc. You have to find what the issue is – or choose a diet that is good enough for most to heal – that’s TGF, BP and AIP (Autoimmune Protocol) onward I have found clinically over the years. Those seem to help most people. I have put the full TGF and Barrier Diets into the book for you. Only instead of just being them this time, I have put them into context with other key diets you might use as a resource to help you and listed them in order of food removal, if you like. For example, the Barrier Diet is between Paleo and AIP (Autoimmune Protocol). My own diet is one beyond AIP – AIP Purity as I call it. But, you could need AIP FODMAPs or even just a simple (!) grain and dairy free option (The TGF Diet) or traditional gluten free might be just fine for you. They are all in there with links to resources and info for each one. This is a really meaty section, full of deeply-researched, clinically-proven and very specific, practical healing help. We have certainly found that the diet just isn’t enough for most to heal properly. If you are bloating with gluten, you need enzymes – which ones? If you are coeliac, how will you ensure your nutrient levels to prevent things like osteoporosis? If you are NCGS with inflammation somewhere in the body, how will you dampen down that fire? If you are a gluten-sensitive with hyper-permeability, how will you stop more intolerances forming? If you are an automimmune person (eg thyroiditis, diabetes etc), how will you slow the progression of your disease? All of these are covered and much more besides. I set out a pick & mix (again, that flexibility!) of healing protocols and add-ons. To start, I have given a core traditional GF protocol, then a TGF one, added a ‘pick & mix’ of add-ons in each section, depending on your needs and test results. I have even given you a suggested staged supplement plan so you know what order to do it in. Plus there is a new Hypersensitivity protocol for those who have difficulty getting the normal supplements in. The biggest part of this section is going through the key healing areas including nutrient therapy, probiotic therapy, inflammation therapy, malabsorption therapy and autoimmune therapy to bring you up to date research and how to use it in practical terms. The section on autoimmunity could be a mini-book in itself, I reckon! Fascinating stuff on the factors involved in developing autoimmune disorders and the (mostly alternative) treatment approaches that have most promise. We finish with a really important section. I fully expect you to get well and certainly improve significantly using the info so far. But I also know there are some cheeky little areas that have proven real bugbears for some people, scuppering their healing efforts despite such hard work to get well. That’s what this section is for: to help you identify the biggest bugbears and what to do about any you find. I think of it as a kind of ‘Chronic Illness Checklist’ if you like – I refer to it all the time. It covers areas such as infections, glutathione depletion, liver detox pathways blockages, methylation difficulties, adrenal and thyroid fatigue, nutrient deficiency and much more. Again, I reckon there is a mini-book in this one, too! How do you test for them? How do you treat them? Where can I find out more? Anyway, I think you get the picture. That’s what’s in the Plan. You can see the whole Contents list in the Preview. Many people asked for a printed version of the TGF ebook and BP, so this time I spent quite a bit of time discovering how to do a print on demand book (not least so I don’t have loads of copies in my garage!). In other words, you order a printed book via Lulu here (or click the image) and they print one off just for you. Sweet . It’ll fair thump through your letterbox! Can I get updates and support? Yes you can. As a purchaser, you will be eligible to join the Barrier & Gluten Planners Facebook Group via a special link given to you in your PDF/purchase thank you email. This is a closed, private group where we chat about all sorts of things plan-related. There are plenty of people already there who are wearing the same T-shirt as you and are a real wealth of information. I chime in when I am called upon (and often when I’m not ;)) and will also post any significant update info there. 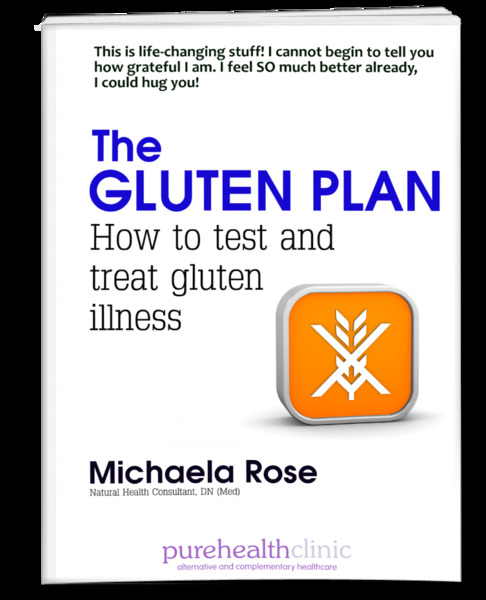 Also, you can always get the latest digital PDF of the Gluten Plan there in Files, which is more up to date than the printed plan, simply because it is much easier to update a PDF than the Lulu book. Blimey. Your Gluten Plan is absolutely bloody brilliant!! Can’t tell you how many light bulbs have gone off whilst reading it. Yep. I’ve put a full 43 page Gluten Plan Preview PDF here. I’ve included the whole contents and a lot of the introduction, followed by random pages and sections to give you a flavour of what’s in it.